Hearing tells us what is going on and where it happens. The ears only give us a running measure of the spectral content of sounds; where sounds arise and what they mean has to be computed by the brain. The effortlessness with which mammals perform this task disguises the feats that are performed. 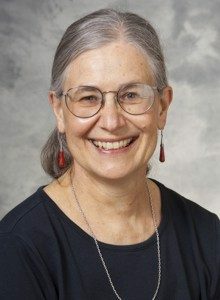 It is our goal to understand how neurons in the cochlear nuclear complex, the part of the brain that receives input from the ear from the auditory nerve, begin these computations and how these neuronal networks are altered by the loss of hearing. We explore these questions by making electrophysiological recordings in vitro. 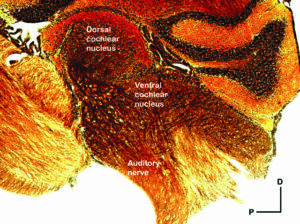 The illustration (below) shows that the cochlear nuclear complex comprises an unlayered ventral cochlear nucleus and a layered dorsal cochlear nucleus whose circuits resemble the adjacent cerebellum. The properties of synapses and the biophysical properties of differ dramatically between neurons in the two regions. Synapses in the ventral cochlear nucleus show little plasticity and act on neurons that preserve the information contained in the timing of firing. Synapses in the outermost layer of the dorsal cochlear nucleus in contrast, are weakened or strengthened by coordinated activity. In mutant mice, the function of these neuronal circuits is altered. We are using mutant mice to learn how these neuronal networks change in animals. In the cochlear nuclei we address questions at several different levels. At the cellular and molecular levels we seek to understand how synaptic function and biophysical properties of neurons are regulated. At the systems level we want to understand how the brain begins to extract information about the location and meaning of sounds. We also seek to gain a better understanding of how hearing loss affects the function of the neuronal networks in the cochlear nuclei. Oertel D, Doupe AJ. 2013. The Auditory Central Nervous System in Principles of Neural Science, Fifth Edition, Kandel ER, Schwartz JH, Jessell TM, Siegelbaum SA, Hudspeth AJ Eds. McGraw Hill Medical, NY, Chapter 31 pp.682-711. Young,E.D., and Oertel,D. 2010. Cochlear Nucleus. In Handbook of Brain Microcircuits, G.M. Shepherd, and S. Grillner, eds. (New York: Oxford), pp. 215-223. Oertel D, McGinley MJ, Cao XJ. 2009. Temporal processing in the auditory pathway. New Encyclopedia of Neuroscience(Squire LR editor) Oxford: Academic Press. Oertel D, Young ED. 2004. What’s a cerebellar circuit doing in the auditory system? TINS 27:104-110. Young ED, Oertel D. 2003. 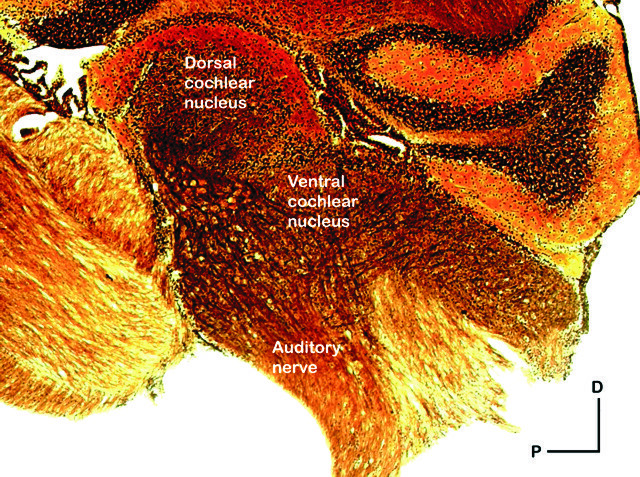 The Cochlear Nucleus. In: Synaptic Organization of the Brain, GM Shepherd editor, Oxford University Press, NY, Chapter 4, pp125-163. Oertel D. 2002. Integrative Functions in The Mammalian Auditory Pathway. Oertel D, Fay RR, Popper AN Eds. Springer Handbook for Auditory Research. Springer, NY. Oertel, D., R. Bal, S.M. Gardner, P.H. Smith, and P.X. Joris. 2000. Detection of synchrony in the activity of auditory nerve fibers by octopus cells of the mammalian cochlear nucleus. PNAS 97:11773-11779. Wright S, Hwang Y, Oertel D. 2014. Synaptic transmission between end bulbs of Held and bushy cells in the cochlear nucleus of mice with a mutation in Otoferlin. J Neurophysiol. 2014 Dec 15;112(12):3173-88. doi: 10.1152/jn.00522.2014. Epub 2014 Sep 24. PubMed PMID: 25253474; PubMed Central PMCID: PMC4269706. Cao X-J, Shatadal S, Oertel D. 2007. Voltage-sensitive conductances of bushy cells of the mammalian ventral cochlear nucleus. J Neurophysiol 97:3961-3975. McGinley MJ and Oertel D. 2006. Rate thresholds determine the precision of temporal integration in principal cells of the ventral cochlear nucleus. Hearing Res 216-217:52-63. Rodrigues ARA and Oertel D. 2006. Hyperpolarization-activated currents regulate excitability in stellate cells of the mammalian ventral cochlear nucleus. J Neurophysiol 95:76-87. Cao X and Oertel D. 2005. Temperature affects voltage-sensitive conductances differentially in octopus cells of the mammalian cochlear nucleus. J Neurophysiol 94:821-832. Tzounopoulos T, Kim Y, Oertel D, Trussell LO. 2004. Cell-specific, spike timing-dependent plasticities in the dorsal cochlear nucleus. Nat Neurosci 7:719-725. Fujino K, Oertel D. 2003. Bidirectional synaptic plasticity in the cerebellum-like mammalian dorsal cochlear nucleus. Proc Nat Acad Sci (USA) 100:265-270. Ferragamo MJ and Oertel D. 2002. Octopus cells of the mammalian ventral cochlear nucleus sense the dynamic properties of synaptic excitation. J. Neurophysiol. Fujino K and Oertel D 2001. Cholinergic modulation of stellate cells in the mammalian ventral cochlear nucleus. J. Neurosci 21:7372-7383. Gardner SM, Trussell LO, and Oertel D. 2001. Correlation of AMPA receptor subunit composition with synaptic input in the mammalian cochlear nuclei. J. Neurosci 21:7428-7437. Bal R and Oertel D. 2001. Potassium currents in octopus cells of the mammalian cochlear nucleus. J. Neurophysiol86:2299-2311. Bal, R. and D. Oertel. 2000. Hyperpolarization-activated, mixed-cation current (Ih) in octopus cells of the mammalian cochlear nucleus. J. Neurophysiol. 84:806-817. Feedback, questions or accessibility issues: techsupport@hslc.wisc.edu.